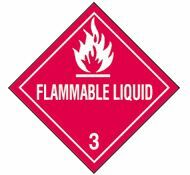 A flammable material can be a solid, liquid or gas. The U.S. Occupational Safety and Health Administration (OSHA) defines a flammable liquid as "any liquid having a flash point below 100 deg. F. (37.8 deg. C.), except any mixture having components with flash points of 100 deg. F. (37.8 deg. C.) or higher, the total of which make up 99 percent or more of the total volume of the mixture. Flammable liquids shall be known as Class I liquids." Compare this definition to combustible, which indicates a material that is somewhat harder to ignite (flash point above 100 oF). OSHA divides flammable (and combustible) liquids into several classes. If you'd like to see these, take a look at 29 CFR 1910.106. Note: The older term, inflammable is identical in meaning to flammable. To avoid confusion, only use the term flammable. Something that is not flammable is called nonflammable. Flammable solids and Flammable gases each have separate entries in this HyperGlossary. For something to catch fire or explode, there has to be the right mix of heat, fuel and oxygen. These are defined by the flammable limits (also called the explosive limits) which are unique for each material. The Standard prohibits more than 60 gallons of Class I or Class II liquids or more than 120 gallons of Class III liquids in one storage cabinet. Cabinets must be labeled in conspicuous lettering with the statement Flammable - Keep Fire Away. For extra safety, your storage cabinets should be self-closing; a flammables storage cabinet isn't much good if your workers leave it open! Handy wall safety posters are available at Safety Emporium. Proper storage and use of flammable materials is absolutely critical in maintaining a safe work place. Never use flammable materials near sources of heat, flame, sparks or static discharge (direct sunlight, furnaces, pilot lights etc.) or in unventilated areas. Solvent vapors are heavier than air. These can pool in low-lying areas and travel significant distances to an ignition source. Also be careful when cutting or welding fuel storage tanks and pipes. A number of fatal accidents have occured when residual vapors were ignited by sparks or flames - see the OSHA fatal fact sheets listed below. OSHA Fatal Fact Sheet #3 - Worker killed while cutting a scrap gasoline storage tank. OSHA Fatal Fact Sheet #53 - Worker killed while welding brackets on an oil storage tank. Safe Work Practices and Procedures: Flammable Materials from the Princeton University Lab Safety Manual. Flammable Materials, an overview at Texas A&M University. See also: combustible, flash point, flammable gas, flammable solid, flammable limits.